These Punishment Pad fitness floor mats are a compression molded rubber made of 95% post consumed recycled rubber designed to withstand the heavy activity of physical fitness facilities. Pebble texture surface provides slip resistance cushioning; has excellent wearing and crack resistant properties. Puncture resistant even under ice skates and track shoes. Free standing mats lie flat without adhesive. Durometer reading of 50 ± 5. 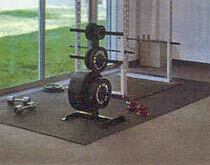 Ideal in areas used for exercise, weightlifting, exercise machines and ice rink off area flooring. Supplied as molded; edges not cut for butting; will require trimming if butted together to cover large area. Orders under $300 material cost will be charged a $10 handling fee. Each rubber Fit Mat weighs approximately 76 lbs. With small orders, it is not uncommon for the shipping cost to exceed the material cost. Prior to the completion of your order entry we will confirm the shipping cost and contact you by phone or email for your final approval.